Against a background of several victories in workplace organisation in the US – notably for California cleaners, Boeing workers and Los Angeles health employees - a movement of students and university staff began coming together. An alliance between students and the labour movement was being forged by the campaign for a “living wage” for campus workers, which soon spread to 150 college campuses. For instance, at Harvard University, students organised to demand that the Harvard administration, sitting on a treasury of $20 billion, pay their janitors and other service employees a wage sufficient to support their families. Many of these workers had to work two jobs—as much as 80 hours a week—to pay for rent and food and medical care. The Harvard students staged colourful rallies in which janitors and other campus workers spoke about their needs. Members of the Cambridge City Council, and trade union leaders including John Sweeney and other high officers of the AFL-CIO, took the microphone to declare their support. The arrival of two young movie stars, Matt Damon and Ben Affleck, to support the campaign attracted a huge crowd. Both had lived and gone to school in Cambridge. Matt Damon had spent a few years at Harvard before dropping out to go to Hollywood. Ben Affleck spoke movingly about his father working, poorly paid, at a menial job at Harvard. When the Harvard administration continued to refuse to negotiate, forty students took over one of the Harvard administrative buildings and remained there day and night for several weeks, supported by hundreds of people outside, with tents spread out on the campus grass. Support for the sit-in came from all over the country, and finally Harvard agreed to negotiate. The upshot was a victory for the campus workers, with Harvard agreeing to raise the pay of janitors to $14 an hour and to give health benefits, and to insist that outside contractors match those conditions. 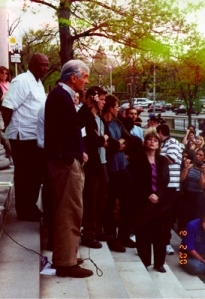 In the spring of 2000, students at Wesleyan University in Connecticut occupied the admissions office, insisting that the university president guarantee a living wage, health and retirement benefits, and job security to janitors and other service workers. After several days of the sit-in, the university agreed to comply with the demands. Students around the country organised a Workers’ Rights Consortium. At Yale University, the University of Arizona, Syracuse University, the University of Kentucky, and on many other campuses, students carried on campaigns to support the demands of working people. The living-wage campaign took a powerful hold on popular sympathies at a time when the rich were becoming richer. This article was taken from Howard Zinn’s excellent A People's History of the United States. We heartily recomment you buy A People's History of the United States now .